This song, which I wrote in April, is a response to what I have observed and experienced, and is also an act of personal accountability. It was not easy to write, and I struggled with how I, as a straight male, could genuinely speak upon this issue. Initially, I tried writing from the perspective of a gay, bullied kid, but after getting some feedback, I felt it wasn’t my story to tell. What I do know, and where I wrote from, is my own perspective growing up in a culture where “that’s gay” was commonplace, with a huge stigma on those who identified and were perceived as gay…Unfortunately, intolerance of the gay community in hip hop is widespread. The best rappers will use homophobic language on albums that critics rave about, making hip hop and homophobia inextricably linked. We have sidestepped the issue entirely, become numb to the language that we use, and are increasingly blinded to our own prejudice. As part of a partnership with Music for Marriage Equality campaign, Seattle-based Sub Pop Records will release the song digitally on July 24 and as a limited run 7″ vinyl on July 31. All proceeds will benefit marriage equality in Washington State. 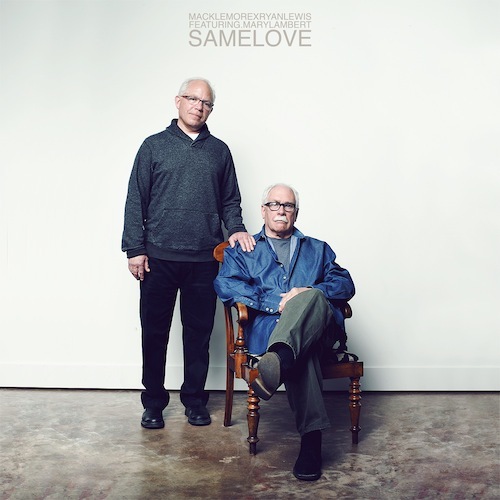 The release of "Same Love" comes on the heels of the duo's announcement of the release date for their debut album, The Heist which is scheduled to be released October 9. The album, which will be the Macklemore & Ryan Lewis first project since 2010's re-release of their debut The VS. EP, will be released independently. In support of their upcoming album, Macklemore & Ryan Lewis are embarking on a world tour. The Heist World Tour will begin this August 5 at Lollapalooza and continue until early December. A complete list of the tour dates and locations can be found on Macklemore & Ryan Lewis's website.